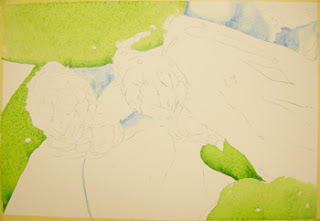 In the next application of paint I used Cerulean Blue (Peacock Blue by Holbein would also be great here!). Keep this really wet as Cerulean Blue is a very opaque color. I searched the photo reference for areas that might have a light blue cast to them. This application is an underpainting for future glazes. I have varied the values to show the textures of the plant. Wetting some areas or working with pigment that has more water creates lighter values.